personalize at ready-to-wear production speed. In addition, as consumers pay upfront for their orders it improves cash flow for businesses. Fashion companies can use personalization as a way to outshine their competitors and earn consumer loyalty, by offering one-of-a-kind products that make their customers feel exclusive. ‘Fashion On Demand by Lectra’, is a game changer for the industry. Drawing from 45 years’ experience of working with international retailers, manufacturers and brands, Lectra developed this offer to break down these barriers and empower fashion companies to meet the specific needs of their digitally savvy clientele with best-in-class solutions. 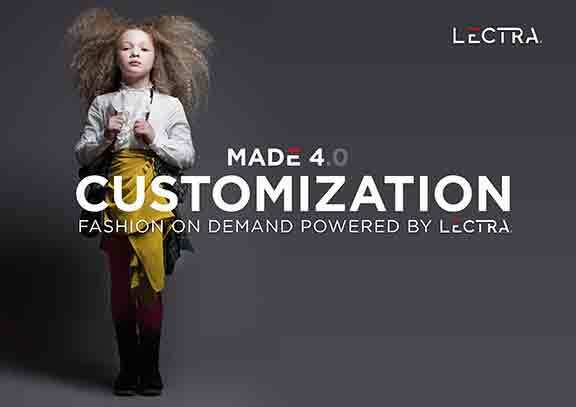 ‘Fashion On Demand by Lectra’, available in the form of two packages, one dedicated to made to measure, and the other to customization, is a turnkey solution that automates on-demand production right from order receipt to production development stages and the cutting room. Companies can define the product customization criteria and range for each item depending on the package (such as altering product characteristics for customization and pattern adjustments for made to measure) and launch production processes right from the get-go, without interfering with their standard workflows. This offer gives fashion companies a 360°-view of the entire personalization process, providing them with the visibility to streamline multiple production processes and manage complex individual demands from custom order to cut piece. Thanks to the supply-chain flexibility that companies gain with this innovative Lectra solution, they will be able to expand their product range and offer more variety, be it womenswear, menswear or childrenswear, and appeal to a broader audience and jump on trends without interrupting their existing production processes. They will not have to waste time on consolidating and communicating information from one production stage to another. This ensures smooth process flows and hence, quick delivery times that can compete with those of standard products.